Subscribe to comments with RSS or TrackBack to 'Qualifying Offers; Are they Working (updated for 2016)'. There’s no truer statement in your post that about Desmond obviously having horrible representation. At the time he turned down that huge extension he’d had precisely ONE good season under his belt, and should have treated Uncle Teddy’s offer to shower him with cash as manna from heaven. I also don’t think teams were scared off of Desmond because of his .233 BA as much as I think they were the fact that his overall stats had declined three years in a row, his OBP had dipped below .300 and he had struck out an incredible 370 times in just two seasons. Combine that with the fact that–fair or not–his defensive woes were made VERY public nationally, to the point where he was mocked on Deadspin, and you have a guy the NATS took a big risk on by even giving him the QO. I read a quote from Desmond somewhere along the way that seemed to indicate that he was “abiding” by the MLBPA desires to turn down extensions, reach free agency, not take “team friendly” deals, etc as being the factors that went into his not taking the extension or the QO. Honestly, I hope he tears it up in Texas (better hitting environment), gets a chance to play some infield and turn himself into some sort of Zobrist-utility guy. You never wish ill will on a guy, especially someone like Desmond who by all accounts was a stand-up teammate and professional. When asked why he didn’t take the Q.O. Desmond gave almost the exact union line about not hurting future players. Like a lot of poorly educated players he bought their advice hook, line and sinker. Not even considering all the $$ he left on the table, he had a chance to play his entire career in 1 city in front of very forgiving fans and be a long time member of the Nats community. Now he gets to be a vagabond for the rest of his career, toting his 3 kids from one city to the next with no one remembering him one week after his career is over. We don’t have any significant memories of him because he was terrible under pressure, whether it was the postseason or his walk year. Who to blame other than the guy in the mirror. Oops. The quote was from when he was asked why he turned down the $107 million. Now that he is signed, I don’t feel so bad for him any more. I mean, I think he deserved more than what he got, but instead of 5/$90, he may make 5/$40-50, and that is still so much money that his family will be well taken care of. I am just glad that he found a team and will not drag into the season. But it brings up two questions: (1) what kind of contract do you think Desi gets if there was no QO? I don’t think too high, since it appears no one wanted him as their SS, which would have taken him a while to accept anyway. 4/$35m? (B) Desi at 1/$8m and the 14 and 29 picks? I would still say A. and I am surprised at my answer, but it made me realize that I have lost confidence in Desi as a core player, as much as I like him as a guy. I’ll take Murphy and the extra comp pick. He’ll have less power, but his contact and OBP will be significant upgrades. Desi had his defensive issues, so it may be a wash defensively. 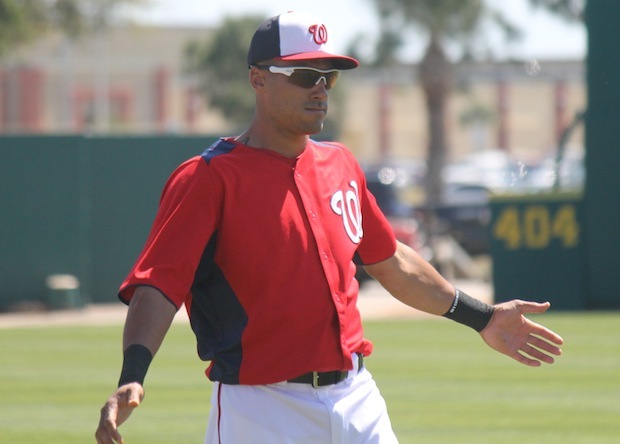 The Nats’ INF defense as a whole will be improved. If you want to put Desi’s ’14 postseason vs. Murph’s ’15, then it gets really one-sided. I don’t know what the Nats would have done if Desi had accepted the QO. I think they were really banking on him not doing so. As others have said, I very much wish Desi well, as he was a key cog in the rise of this franchise. The way he declined the last three years, though, I wasn’t a fan of the long-term offer that he turned down. If Rizzo knew how easy it was going to be to steal the SS of the future, he probably wouldn’t even have made that Desi offer in the first place. I fear Mark is right, that Desi will be making at least four or five more stops to keep his career alive. If it can happen to a player the quality of Rollins, it can happen to anyone. Have glove, will travel. – Murphy at 3/36 and 28th, 29th pick. If you think Desmond is a bounceback candidate, then you go option A. The odds of the 14th overall pick panning out are much higher than even 28th or 29th pick. What doesn’t get talked about is how much the Kansas City Royals devalued Desmond. They proved how important it is to put the ball in play, as opposed to striking out 185 times a year. Todd,if every year your stats are worse than the year before what are the chances of a bounceback season? That’s a good way to lay it out, Todd. I think that you have to believe that Desmond isn’t just going to bounce back to 2014 Desmond, but that he’s going to bounce back to 2012-13 Desmond, in order to prefer the Desmond option. None of the projections that I’ve seen on FG or BR think that Desmond comes close to that. For comparison, the four different projections posted by FG have Murphy putting up between 1.6 and 2.1 WAR (1.9 average) where Desmond is projected for between 0.4 and 1.8 WAR (1.05 average) – and the 1.8 for Desmond is the outlier, a crowdsourcing fans-generated number based on nine ballots submitted. The difference from the numbers-based services between the two is slightly broader, with Murphy holding at an average of 1.9 WAR and Desmond slipping to 0.8. Now projections are projections, and I’m not certain whether all of those take into account Desmond’s expected shift to LF (which would hurt his overall WAR). If he’d stayed he obviously would have played SS. The Desmond option is very much the boom-or-bust scenario; he’s more likely to put up 4 WAR than Murphy is. He’s also more likely to be completely useless. MarkL: well yeah good point; Desmond has been trending down every year since his peak in 2012. So not exactly a good bounce back candidate.